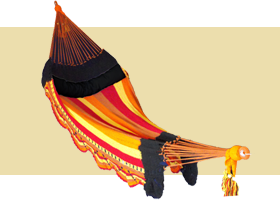 Welcome to Lazy Bandido, the Best Hammock Company Online. Now that we’ve been sufficiently modest, an explanation: At Lazy Bandido, we’re a different kind of online hammock company. Here’s why we’re the best. Ok, so we’re pretty sure there’s no such thing as a big box hammock store. But our point is this. We don’t want to be the Walmart of the hammock world. We’re not the cheapest. We don’t carry every variety of hammocks ever made. And we don’t have waxed linoleum floors. The Lazy Bandido hammock store is more of the swinging double doors, wooden floors with spur marks, silver spittoon at the entrance variety. Informal. Fun. The occasional loud-mouthed, gun-wielding drunk in the corner. The Best Hammocks. The Best Hammock Store. We believe a hammock should be comfortable and beautiful. Hammocks are used for naps. Naps are about relaxation. Relaxation is about escape. And escape is about adventure. Our hammocks are about that adventure. Beautiful, living pieces of art hand-woven by a culture that’s been perfecting them for over 500 years. And the styles reflect that culture; the chaos, the danger, the rebellious nature, the spiritual vibe, the revolutionary spirit. A Hammock Company Should be Honest, Fair, and Easy to Deal With. Honesty: We’re not for everybody. Need a camping hammock? Don’t buy a Lazy Bandido. Buy a lightweight, waterproof model that’ll fold up into the smallest pocket of your backpack. Hennessy Hammocks sells the best. Eagle’s Nest Outfitters is great too. Want the cheapest hammock? Go to Amazon.com. Want to put a hammock in the backyard and never take it down? You’ll want a weather resistant model. Check out Pawley’s Island, and buy the Duracord model with a stand. Want the most comfortable hammock you can find? Or a beautiful model that’ll look great on your patio? Buy from us. We’re the best hammock company you’ll find. Fair: All our hammocks carry a 1 year 110% guarantee. If you decide you don’t like your hammock. Or, it’s not the right style. Or size. Or whatever. Return it. We can exchange it for another. Or will give you all your money back + some of ours. Why? Because it’s fair. And one more thing—Don’t feel like paying $18 for shipping? Like us on Facebook. We usually have a promo code on offer. Easy to deal with: In by addition to our website, you can order by phone, mail, or by clearly writing the desired style and accessories on a post-it note and affixing it to a highly-trained pack mule sent to our front door. (Seriously, if you have a trained mule send him. The hammock will be free.) Returns are 110%. Exchanges are always ok. You don’t even need a good reason. “Umm because” is good enough for us. Still reading? Stop. Take out your wallet and buy a hammock. We’re 110% confident you’ll love it.